This book addresses the organizational and performance implications that modularity has through a review of the managerial and engineering literature. 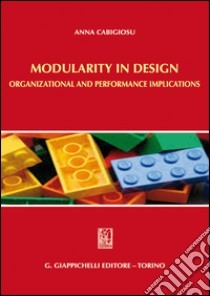 The first chapter introduces the definitions and measures of modularity in design developed so far and compares them. The second and third chapters focus on the mirroring hypothesis, which postulates a relationship between product modularity and the way firms organize to design and produce them. Chapter IV reviews the available empirical evidence on the mirroring hypothesis, while Chapter V presents a review of the empirical studies providing quantitative evidence on the performance implications of product modularity, namely the impact that modularity in design has on supply chain management, manufacturing, new product development, alliances, customer satisfaction and the firm's economic performance. The conclusions section summarizes the main topics and findings illustrated in this book and identifies open research questions and new research trajectories.